GATE 2019 exam pattern contain details about number of questions asked in the examination, number of sections, marking scheme and time duration. Graduate Aptitude Test in Engineering (GATE) is conducted for admission to M.E./M.Tech/Direct Ph.D programmes in IITs, NITs, GFTI and various private institutions. This exam is organized by IIT, Madras for the year 2019. Check below GATE exam pattern 2019 in detail. 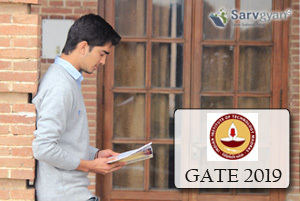 GATE 2019 Notification, Eligibility, Syllabus & other details have been released. The application form filling has been started from 1st September 2018. The examination of GATE for 24 papers will be conducted in online mode only (Computer Based Test). Candidates can appear only in ANY ONE paper of GATE exam. GATE 2019 examination will be held on 2nd, 3rd, 9th & 10th February 2019 during forenoon (9:00 AM to 12:00 Noon) and afternoon (12:00 PM to 5:00 PM) sessions of weekends. GATE will also be conducted in International centres and the session timings at as per their local time. Question Type: The question paper of GATE 2019 consisting of both multiple-choice type (MCQ) and numerical answer type (NAT). For objective type questions, there are multiple options available out of which students have to choose only the right answer. For numerical answer type questions, candidates have to enter a number using the virtual keyword available on the computer screen during the examination. Number of Questions: The question paper of GATE will contain 65 question of maximum 100 marks. Note: CE, CS, EC, EE and ME papers: Examination may be conducted in multiple sessions. However, a candidate is allowed to appear in only ONE specified session. In the papers of AE, AG, BT, CE, CH, CS, EC, EE, IN, ME, MN, MT, PE, PI, TF and XE, Engineering Mathematics will carry 15% marks of total marks, General Aptitude section will contain 15% marks and rest of the 70% marks will be contained by the core subject of the paper. In the papers AR, CY, EY, GG, MA, PH, ST and XL, General Aptitude section will carry 15% of the total marks and remaining 85% marks will be carried by the core subject of the paper. The General Aptitude section 5 questions of 1 Mark and 5 questions of 2 marks. Question paper other than GG, XE and XL will contain 25 questions of 1 mark and 30 questions of 2 marks. Section A – Engineering Mathematics (compulsory section) – contains 11 questions (7 questions of 1 mark and 4 questions of 2 marks). GA – General Aptitude carrying of total 15 marks. Any two of XE sections B to H – contains 22 questions (9 questions carrying 1 mark and 13 questions carrying 2 marks). Students can choose the sections during examination after viewing the questions. The question paper will consist of two parts: Part A and Part B. Part A is common for all candidates. Part B has 2 sections; Section-1 is of Geology and Section-2 is of Geophysics. In Part A, there is total 25 of 1 mark each. In Part B, each section contain 30 questions of 2 marks. Note: Apart from core subject of the paper, General Aptitude (GA) is the common section in each paper of GATE. There is a negative marking in GATE for multiple choice questions. For Numerical answer type questions, no negative marking will be there. For 1-mark question, 1/3 mark will be deducted for wrong answers and for 2 marks question, 2/3 marks will be deducted. If candidates have any query regarding GATE 2019 Exam Pattern, they can leave their comments below. Sir is there is necessary to pass the individual subject which is compulsory like chemistry & general aptitude for XL GATE exam??? yes, you must score qualifying marks in each subjects. i am a ME student,i have some doubt in gate examination -for qualifying a gate 2019 -what are the core subjects to be prepare for gate from know on words start preparation until attend exam in february 2019 in short period i will try my level best ,please give sollution . Im a Mechanical Engineering student(B.E.MECH).. which paper should i choose? Since there are other papers related to mechanical engineering..
Also.. If i choose to write one paper(Mechanical).. can i change it to another(mining) since im planning for further studies??? I am student of btech in agricultural engg. Which type of question pepar code i have to fill?? is there any cut off mark to pass the gate exam?im an ME student,which type of question paper ahould i choose ?? Cut off will be released after the result declaration. Exam is going to held in which place? How can I check that I have before applied a gate2018.?? Not eligible, Graduation is required. I have completed graduation.Now I am in M.sc. 1st year, am I eligible for gate exam 2018 ??? read article again, details has been given. SIR,SUGGEST ME ANY GOOD THEORITICAL BOOK FOR PREPARATION GATE COMPUTER SCIENCE ENGINEERING? Visit here GATE 2018 preparation books. After cracking GATE exam, with the score card we can apply for M.Tech in colleges, other then what is the options. In which sector (Job) it will helpful. yes, you can apply for M.Tech, if you score good marks you may apply for PSU’s like ONGC, IOCL, BHEL, NTPC etc. i am in btech in food technology then which type of question paper code i have to fill. Actually am in b.tech final year mechanical .. Iam not willing to write in gate 2018 .. may I eligible to GATE 2019 .. I m a student of third year engineering in Information technology . Which subjects should I select for GATE-2018 exam? What are the books should i refer?Is there any proper coaching class for GATE exam? What about these 1000 marks ?? ?how they calculated??? For Numerical answer type questions, no negative marking will be there. This applicable for 1 marks question? I am b.teck second year student …can i give gate exam 2018…? ?